Hasbro has updated their official Instruction Sheet website to include several new sheets for their consumer products. The list includes Transformers. Among the new sheets are few known names such as Titans Return Story Book (which was available since last July via Hasbro Pulse) and several Rescue Bots instructions for recent toys. Power Of The Primes sheet contains character posters of the four finalists of the vote. 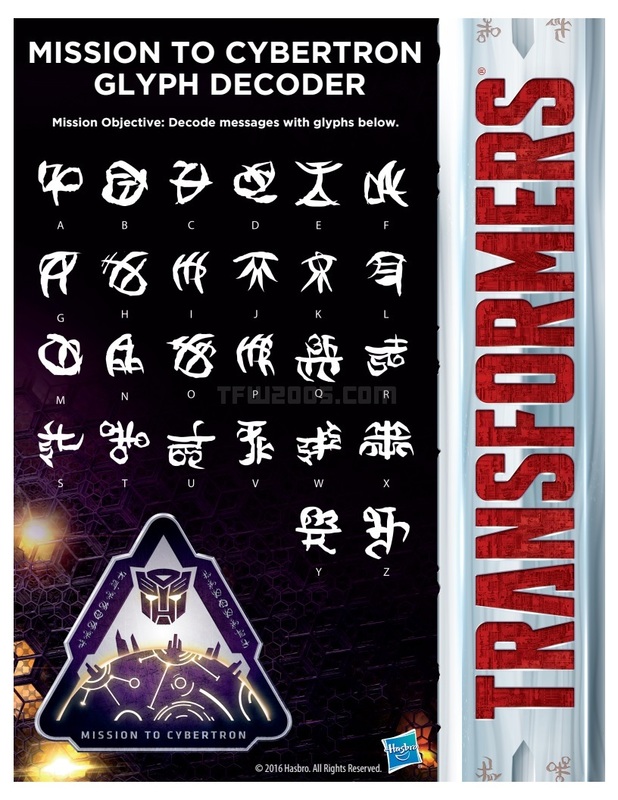 Additionally, a mysterious new sheet titled as Mission To Cybertron Glyph Decoder is also listed. Unlike other titles, this one is a completely new instruction sheet previously unheard of. Upon close inspection, you may notice the similarity between the sheet and the recently revealed packaging for Transformers: The Last Knight toyline. Generations line carries the plain red Transformers title on a black background while RID and Rescue Bots display it on plain white and red backgrounds respectively. However, the TLK toyline features the unique metallic grey background seen on Deluxe Barricade, Deluxe Berserker, Shadow Spark Optimus Prime and Optimus Prime Voice Changer Helmet as well as the unique red Title Font with a ‘circuit board’ pattern. We currently do not know for what reason this sheet is used but the upcoming TLK Cybertron Playset may very well play a role to this Decoder Sheet. Note: Since there is a difficulty in downloading the sheet from the official website, we’ve downloaded it, converted to image and attached it with this news post for your convenience. Check it out, after the jump. "Be sure to drink your energon"
Since the Glyph Decoder is for the new movie, I'm guessing some sort of a toy play pattern or an activity on the official website is planned. I'm guessing the Hasbro TF Toy Site will be updated following NY Toy Fair. I hope the Transformers website isn't as boring as it was for the last movie. Glad they finally made this after ten years of this language existing. Now this is pretty cool ! So ROTF Starscream has a random letter X on his wing. Huh. Too bad that these symbols do not match the symbols on Megatron's helmet, which was published on June 23, 2016. Quite funny this popped up today after I used the cyberglyphics for my sig a couple of days ago. This is just the Language of the Primes from ROTF. This kinda gives me nostalgia from my childhood when I'd decode messages in Bionicle. Old Bionicle was the best hands down. I hate that they discontinued it, just to try and do that hard reboot, and fail. Pretty neat. I miss this kind of stuff. i know! i miss that so much!!! makes me want to have my avatar be "Marvel B" in both languages, maybe more…..
Must be a new flavor of Ovaltine. So were going to get somthing like the E.D.C. From Season 3 of Transformers?